This module is designed to make plots of mean-sea-level-pressure (mslp), but they are basically just contour plots, so the functions can be used for any (continuous) scalar variable (with appropriate specification of levels). ‘contour’ - straight contour plot of a single pressure field. ‘spaghetti’ - spaghetti-contour plot of multiple pressure fields. ‘spread’ - mean-contour plot with error bars derived from an ensemble of pressure fields. Make hints for the contour label placement algorithm - these stabilise the positions of the contour labels between frames in videos. They don’t eliminate the problem of jittery and flickering contour labels, but they do help. CS (matplotlib.contour.ContourSet) – Contours to be labeled. iterable of (x,y) tuples - each a position hint for a label. Generic function for plotting pressure. Use the ‘type’ argument to choose the plot style. pe (iris.cube.Cube) – Variable to plot - must have dimensions ‘latitude’ and ‘longitude’. type (str) – Style to plot. Options are:’contour’ (default), which delegates plotting to plot_contour(), ‘spaghetti’, which delegates plotting to plot_spaghetti_contour(), ‘spread’, which delegates plotting to plot_mean_spread(). 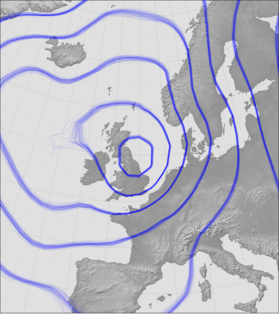 See matplotlib.axes.Axes.contour() - Also adds the lines to the plot. Plots a variable as a contour plot. This is the same as matplotlib.axes.Axes.contour(), except that it takes an iris.cube.Cube instead of an array of values, and its defaults are chosen for plots of mean-sea-level pressure. label (bool) – Label contour lines? Defaults to False. If it’s ‘video’ use stablised label locations. resolution (float) – What lat:lon resolution (in degrees) to interpolate pe.data to before plotting. Defaults to None - use original resolution. scale (float) – This function is tuned for data in hPa. For data in Pa, set this to 0.01. Defaults to 1.
linewidths (float) – Line width for contour lines. Defaults to 0.5.
alpha (float) – Colour alpha blend. Defaults to 1 (opaque). fontsize (int) – Font size for contour labels. Defaults to 12.
zorder (float) – Standard matplotlib parameter determining which things are plotted on top (high zorder), and which underneath (low zorder), Defaults to 30. Plots contours of the mean of an ensemble, mark uncertainty by fading out the contours where the ensemble spread is large. pe (iris.cube.Cube) – Variable to plot.- must have dimensions <ensemble_dimension>, ‘latitude’ and ‘longitude’. ensemble_dimension (float) – name of the ensemble dimension. Defaults to ‘member’. linewidths (float) – Line width for contour lines. Defaults to 0.2.
label (bool) – Label contour lines? Defaults to False. cmap (matplotlib.colors.LinearSegmentedColormap) – Mapping of pe.data to plot colour. Defaults to blackblack semi-transparent. threshold (float) – Ranges shown are regions where the probability that a contour line passes through the region is greater than this. Defaults to 0.05 (5%). vmax (float) – Show as ‘most likely’, regions where the prob of a contour is greater than this Defaults to 0.4 (40%). line_threshold (float) – Only draw contours where the local standard deviation is less than this. Defaults to None - draw contours everywhere. zorder (float) – Standard matplotlib parameter determining which things are plotted on top (high zorder), and which underneath (low zorder), Defaults to 40.
label – Label contour lines? Defaults to True. Plots a multi-contour (spaghetti) plot. See matplotlib.axes.Axes.contour() - except it’s an array, one for each member. Also adds the lines to the plot.